Mornin'! This will be the last Wildwood Weather blog until November 3rd! So, "adios" October and "bienvenue" November! And, Happy Halloween (my favorite holiday) to my kindred spirits. It's 59° in Wildwood. We've got clear, starlit skies and light breezes. Another nice morning to soak in. It'll be a sunny day with "bad hair day" breezes thrown in the mix (N 19-23mph). Temps should hovering around low 60s. Tonight...still breezy (NE at 17-20mph), clear and temps in the low 50s. Saturday...much of the same and not as breezy. Sunday...calmer, cloudy and in the low 60s. Don't forget about the clocks next weekend: "fall" back so turn the clocks back 1 hour next weekend on Halloween night (10/31) as we all enjoy an extra hour sleep! And, that upcoming Full Moon...it's Tuesday (10/27) and will rise at 6:33p.m. if the horizon is clear at the beach it's really something to see. Oh...don't forget that moon will cause much higher tides so keep an eyebrow up for any street flooding that could occur especially if it's raining. Mornin'! It's 57° in Wildwood. Just like every other morning this week it's quiet with no breezes, beautifully starlit dark skies and the aroma of the sea in the early morning air. It's a perfectly lovely morning. And, it'll be lovely weather again today as Ms Sun is still checked in and will be shining down and warming us. She'll be rising around 7:15a.m. Temps will be in the low 70s as we have a taste of Indian Summer today. Breezes will be out of the S-SW at 10-15mph. Tonight..clear, mid-upper 60s with SW breezes at 14-16mph. That ol' Hunter's Moon has us in its sights as the Full Moon is Tuesday (10/27). October’s Moon is the Full Hunter’s Moon, as it was the time to go hunting in preparation for winter. This full Moon is also called the Travel Moon (which I'll be doing). This is the first Full Moon following the Harvest Moon last month. It rises at 6:33p.m. on Tuesday and sets around sunrise, the only night in the month when the Moon is in the sky all night long. I'll be doing a Wildwood Weather break next week but will post various weather links that in my opinion are most accurate. Also, I'll post live webcam links in Key West for those that want to try and find me vacationing there. I'll be incognito though as Halloween costumes and makeup are packed and ready for travel! Mornin'! It's 54° in Wildwood. Nice morning out there...clear and calm (not a breeze to note) with the most stunning star lit sky. It's feeling much less crisp and wintry that's for sure. It'll be a lovely autumn day down the shore as temps climb into the upper 60s and possibly tapping 70° with Ms Sun pouring down and breezes light out of the SW at 7-9mph. 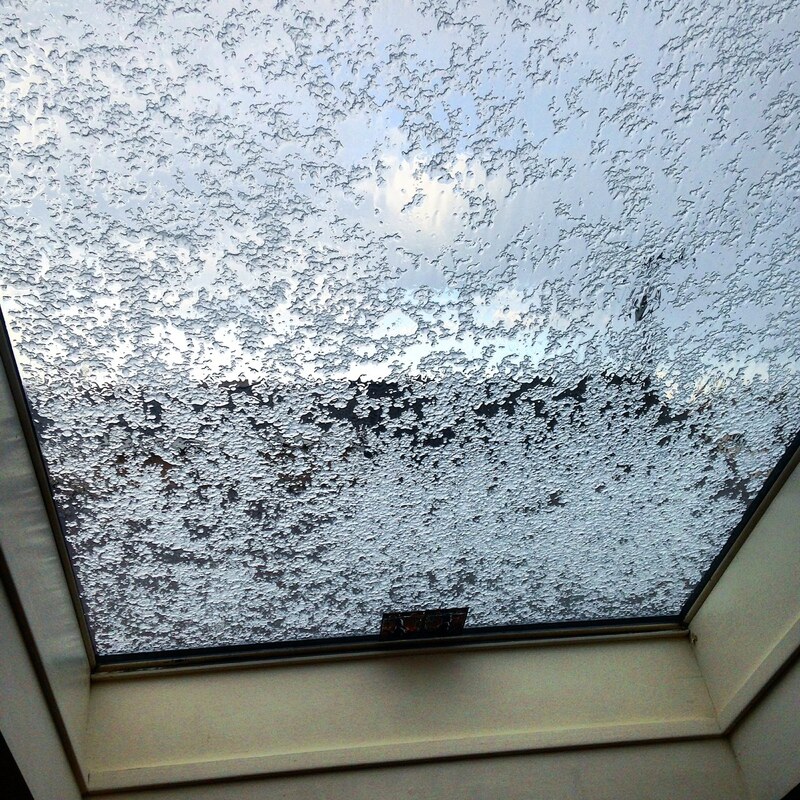 Time to crack open those windows again! Tonight...low 60s, clear with breezes out of the S-SW at 12-14mph. Tomorrow...just about the same as today. Friday...blustery. At this time the weekend's looking 50-50 as Saturday's looking like the better of the two days...sunny and cooler as Sunday's...blustery and rainy. Remains to be seen. The blog hiatus is coming beginning this weekend as another visit to Key West is on my horizon! Mornin'! It's 40° in Wildwood. It's clear and starlit. It's breezy (SW at 20-23mph). It's chilly. It'll be a decent autumn day down the shore though. Ms Sun's gonna shine! It'll be sunny and in the low-mid 60s. Breezes will simmer down a tad at 15-20mph from the SW. Tonight...clear and still a bit breezy with temps in the mid 50s. Tomorrow...warmer. Thursday...even warmer (might get in the mid 70s). Spring-like weather's not over yet. Saturday's looking A-ok for the Italian Fest in Wildwood! Mornin'! It's 37° in Wildwood. Baby it's cold outside! I'm not adjusting very well to these frosty, cold temps. I'm sitting here typing away with cold finger tips. I keep looking at the thermostat and wondering why our heat's not on yet. Our little gas fireplace is though as it removes the chill in the house and that's a very good thing as it'll been doing its job until we hit the big button on the house heater. We don't give in easily. But...the cold season is upon evident in the snow flurries and big slushy flakes planted on all the vehicles and railings and the hall skylight yesterday afternoon. That wasn't in any forecast. I'm just not ready for the cold. It'll be chilly and fall-like today with Ms Sun pouring down and hopefully warming the island as temps go into the upper 40s and maybe tapping 50°. Breezes will be out of the NW at 5-10mph. Tonight...clear with breezes out of the SW at 17-19mph and temps in the low-mid 40s. It's supposed to get warmer this week with each passing day until we're in the 70s again...thank goodness. Mornin'! It's 39° in Wildwood. I regret saying that's no typo. We've got us a little frost on the pumpkin this morning. I spent most of yesterday re-potting and pruning the outdoor tropical plants. They all spent the night warm and cozy back in the house and missed that 39° that was forecasted. Hopefully they'll all survive the winter only to return to the outdoors in 2016. There's actually no frost out there in the early morning darkness that I can see. Nothing on the plants, ground, vehicles etc. yet. Today will be sunny and cool with temps just about tapping 50°. Tomorrow...warmer and tuesday even warmer as temps head back into the upper 60s/low 70s. So, we're not completely in it yet. It'll be a nice chilly football kinda day. Breezes will be out of the N-NW at 17-23mph a little later as there's nothing to note for a breeze at the moment. Tonight...clear, mid 40s while N breezes continue at 15-17mph. Mornin'! It's 52° in Wildwood. Ms Sun's up and shining brightly in a cloudless sky and no breezes to note. It's chilly. It's chilly in the house too! It'll be a cool autumn day with sun shining down and breezes commencing later out of the NW at 10-20mph with temps in the upper 50s. Tonight...clear as breezes calm down some NW at 10-15mph with temps dropping down into the low 40s. Tomorrow...about the same but cooler. Wildwood's got a jammed packed weekend of activities including North Wildwood's Jaycee's bonfire on the beach and the Fabulous 50s weekend and the Lighthouse Challenge! Mornin'! It's 60° in Wildwood. It's breezy (W-NW) and clear (stars-are-a-shining-down). Ms Sun's due up in about an hour. It'll be another lovely autumn day with mostly sunny skies, breezes out of the W-NW at 10-13mph and temps in the low-mid 60s. Tonight....partly cloudy and breezes still out of the W-NW at 15-18mph and temps in the low-mid 50s. Tomorrow and Sunday...sunny and bright but chillier temps (low-mid 50s with even colder temps at night) and windy. Mornin'! It's 56° in Wildwood. We've got partially clear starlit skies. There are some clouds in the darkness. No breezes. It's quiet with no sounds of the surf heard in the distance. It'll be another nice one as Autumn continues to show it's quiet, calm self. It'll be sunny today with temps in the low-mid 60s with breezes out of the NW at 13-15mph. Tonight...down into the 50s (upper 50s) with breezes out of the S-SW at 17-21mph. It looks like the weekend is going to continue with nice weather albeit cooler and breezier but Ms Sun will be checked in. Mornin'! It's 59° in Wildwood. We're under clear, starlit skies as the breeze (NW) is very light and not worth mentioning. We did have rain showers last night which I failed to put in yesterday's forecast. Today though... it'll be a lovely autumn day down the shore with sun shining down breaking through some morning cloud cover, temps tapping 70° and breezes out of the W-NW at 10-15mph. Tonight...clear with temps down into the upper 50s and breezes 10-15mph out of the NW. At this point, it looks like the weekend's going to be sunny yet very breezy with much cooler temps (low-mid 50s) just in case you need to know what to pack. The weekend's got the Fabulous 50s/DooWop dance party/festival, the Jaycee's Beach bonfire in North Wildwood as well as the Lighthouse Challenge of New Jersey. We're still heating things up in Wildwood! Mornin'! It's 64° in Wildwood. It's clear and starlit with a light breeze (5-7mph) out of the Southwest. It'll be nice today...mostly sunny (some clouds could roll in) and nice with temps in the mid-upper 70s and breezes out of the SW at 10-20mph. Tonight...temps back down into the mid-upper 50s and W-NW breeze at 15-20mph with some clouds in the mix. We had a lovely weekend in Berks County PA visiting our life long friends (from high school) over the holiday weekend and got to breathe in the mountain, woody air and see some beautiful foliage from the Blue Mountains (eastern edge of the Appalachian Mountains). It was nice though when we hit the marshes on the way home as that salty, briny, seashore aroma as always placed a big smile back on my face! Good to be back on the island! Mornin'! It's 59° in Wildwood. It's clear and crisp with a light NE breeze at 10-12mph. It'll be mostly sunny today with fall-like temps (low-mid 60s) and those NE breezes staying checked in. Tonight...mostly clear and chill-chill with temps going into the upper 40s (no typo) and breezes still out of the NE at 6-9mph. Tomorrow...sunny, mid-upper 60s and calm winds. Monday more of the same. It'll be a perfect Autumn weekend to celebrate the season's closing of Morey's amusement piers and of course all the weekend events. We still have the events going on ( http://www.wildwoodsnj.com/ ) this weekend! Since I'll be checking out and hitting the bricks this holiday weekend...I'm taking a tiny hiatus on the blogging. See ya Tuesday! Mornin'! It's 64° in Wildwood. It's clear, crisp and starlit. It's breezy with a stiff sea breeze (S 15-20mph) and it feels terrific. It's a nice start to the day as Ms Sun pours down and sea breezes keep us refreshed. Temps will be in the mid 70s. By this afternoon...not so much. Stiffer winds and rains-are-a-coming later. 30% chance of an afternoon stray shower and tonight...80% chance. Winds out of the S-SW at 19-28mph w/gusting. We could get some rain on the overnight too. Temps...upper 50s. The weekend's still looking like a keeper with Ms Sun shining on the wake-up and temps in the mid-upper 60s. Mornin'! It's 57° in Wildwood. It's a clear, quiet, still, aromatic morning. Along with all the serenity outside, you can smell the (some say "stinky") marsh land. I love it! We've got some stars twinkling in the darkness as the breezes are nothing to write home about. We're going to have a day much like yesterday...sunny with mild temps tapping 70° and breezes out of the NE initially at 4-6mph and shifting this afternoon from the SE at 9-11mph. Tonight...clear with some passing clouds as temps drop back into the upper 50s and breezes light and variable out of the SE. Still looks gray and rainy tomorrow (beginning in the late afternoon/early evening) into Saturday morning. But, the holiday weekend's still holding its own with mostly sunny, mild conditions. 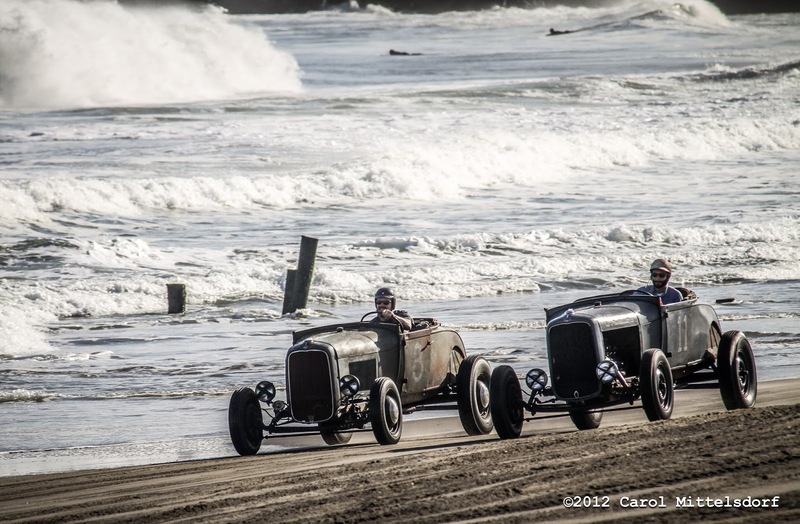 Plus, Wildwood still has some events to enjoy this weekend! Wildwood's doing their annual Music/Seafood Festival, Morey's closing day is Sunday, The Race of The Gentlemen (on Wildwood's beach), the Cape May's Victorian Weekend and Wine Fest is this weekend. Oh...reminder: the New Moon is Monday and is just as powerful as the Full Moon in regard to tides. So, keep that in mind if you see street flooding...it's the ocean water and should be avoided as it does very ugly things to the undercarriage of your vehicle which many will see from last weekend's attempts to traverse all those flood waters. Mornin'! It's 57° in Wildwood. We're currently under partially cloudy skies with some stars and the moon shining through. It's still with no breezes to note. It looks like another lovely Fall day today with temps in the low 70s as Ms Sun shines down and breezes wift (I mean waft) over the island from the North at 8-10mph. Tonight...clear and mild with temps in the mid-60s and breezes staying out of the North at 5-8mph. I'd be contemplating a "beach day" if I wasn't sitting in the office. And, just an fyi...looking rainy Friday night into Saturday morning. But, overall a decent Columbus Day Weekend. I also saw that the autumn foliage is behind schedule due to the unusually warm September (guess Mother Nature thought it was still summer). And, the bird migration is happening on the island as lots and lots of birds are dropping by and sharing space with us as of late! Mornin'! It's 55° in Wildwood. It's quiet and still (no breezes) with clear, starlit skies. A stark difference to 3 days ago. We're back to normal whatever normal is these days. One thing's for certain...we've got us a lovely autumn day up ahead with Ms Sun pouring down and breezes out of the North at 6-11mph while the thermometer taps 70°. Tonight...some clouds rolling in but mainly clear with temps back down into the upper 50s and winds light and variable. Boring. Coastal Flood Advisory Posted until 7p.m. Mornin'! It's 58° in Wildwood, NJ. We're dry and under cloud cover (what else is new) and actually had about a half dozen peeks of sun yesterday! It's still windy as hell as our island's still getting battered (well...less battered). We're going to see Ms Sun today as she's actually going to check in today as we prepare for partial clearing and some blue sky. There is a 20% chance of a shower today so I'm going with partly cloudy/partly sunny. Unfortunately, the winds aren't going anywhere yet...NE 25-30 mph w/gusting but by this afternoon we'll see a significant simmering down thankfully. Temps will be in the low-mid 60s. Tonight...clear, with winds simmering down even more. Tomorrow looks like a keeper if that helps (haven't had a keeper in awhile)! Rip Currents:High (means dangerous conditions and potentially life threatening condition for all people entering the surf. Although the Surfers are still drooling). Mornin'! It's 61° in Wildwood. It's dry (thanks to the winds). Also thanks to the winds...my yard is covered in debris from the trees. It's gray and overcast. It's loud (freight train winds haven't taken a break) as the winds remain out of the NE at 35-42mph sustained with gusting (50mph). Temps may go up a degree or two (62°-63°). It's chilly and raw and miserable outside. I never desired sunshine and stillness so much before. It's 4 days of this now. We're to expect more of these winds for another couple days (albeit a tad calmer) yet I'm seeing peeks of sun on today's forecast! Flooding is still a concern though so our vehicles are staying parked blocks away on higher ground to avoid this afternoon's high tide. 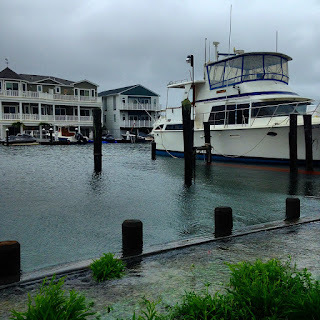 We had a couple heavy flooding moments yesterday and throughout the night as the harbor overflowed again heading in our direction (¼ block away). The wellies are still sitting by the front door. Tonight...more of the same as temps go down into the upper 50s and the winds stay checked in (NE 30-35mph). Tomorrow...looks like overcast and chance of rain showers and more winds. What else? Mornin'! It's 61° in Wildwood. Whew is all I can say. 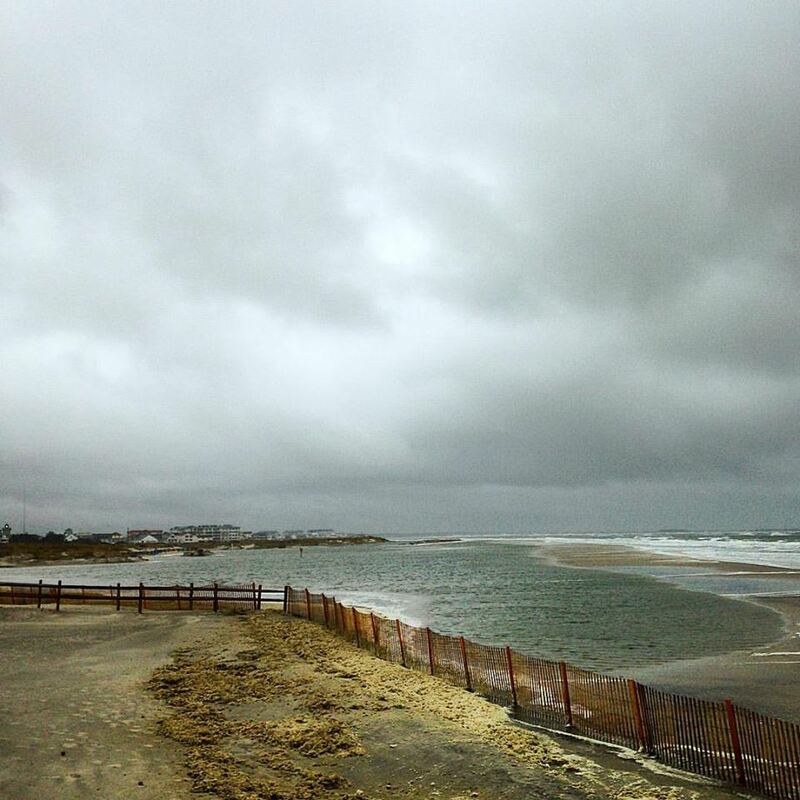 All the weather forecasts are saying a Coastal Flood and Wind advisory is still in effect. 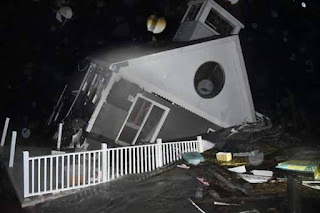 My photos are of a house that was consumed by this Nor'easter yesterday. I've been living here for awhile now (over 11 years) but this will be the first for living through the most relentless Nor'easter. This bad boy just won't check out. It won't give us a little bit of a break as howling, freight train gusts of winds are bound and determined to make life challenging. It's currently cloudy and windy (E-NE 35-46mph sustained winds). It does appear we missed the bullet again as far as I can tell...no wind or water damage (assessments are tough while being blasted as wind damage usually shows itself later). Our vehicles are still blocks away on higher ground (hope they're ok) and we have no flood water in the house or shed. But, those waters breached the bulkheads (¼ block away) and headed to my front steps yesterday afternoon in break-neck speed. Scary. Actually the scariest was the Skunk that was drowning under my shed as the yard filled with 3+inches of water (it eventually released itself and swam away). Anyway...this Nor'easter isn't going anywhere anytime soon. It'll be cloudy and windy today with temps in the mid-upper 60s. Winds will continue to pound us from the E-NE at 28-35mph with 50+gusts right into tonight. Expect off and on showers today as well (70% chance). Tonight...more rain showers (50% chance) and temps in the low 60s with those 50+mph gusts whooping it up some more. I'm hearing that Hurricane Joaquin is no longer a threat to our coast (praise the Lord) but could effect our wave and tide action from it's location by tomorrow and/or Monday. You can bet the Surfers are drooling. Mornin'! It's 59° this early morn. Hearing lots of "Just In Case" as of late. But, preparedness is key when a Nor'easter and Hurricane have you in their sites. Wildwood's no worse for wear as everything's status quo. We've had some stormy conditions since late last night as winds and rain have been pounding the coast. There's a Coastal Flood Warning posted and we're being told to prepare for the worst...floods and wind damage. So far so good though. Some flooding here and there on the streets at high tide (not much in my neighborhood on the West side) although our vehicles are moved to safety just in case. The winds (N-NE 37-45mph gusting over 50mph) have yet to cause damage near or around my home (thankfully) and will continue to batter us today, tomorrow, Sunday and maybe even Monday. The hatches are battened down as all summer furniture and plants etc are secured and/or stored away just in case. I saw an incredible amount of boats on trailers being high-tailed to safety all throughout the day and evening yesterday. At the moment, it's dark and chilly this morning as temps maintain where they are now...upper 50s/low 60s today. There's a 90% chance of rain today. If you combine those showers with those winds = "ouch" as it feels like tiny needles of rain sandblasting and sloughing any exposed skin. Tonight...more of the same with winds and rain relentlessly pounded the island not to mention very high tides. Tomorrow...more of the same. Many of our beaches as we know them are gone as the ocean has met the dunes in many places. Now, as for Joaquin...at this writing, it's appears as though we're going to dodge the "direct hit" bullet. Wildwood will certainly feel the effects with winds and tides but it looks like the hurricane will stay safely out to sea and just off our coast. Whatever Joaquin does, Wildwood will feel exhausted after all this wind and water. Better to feel exhausted than completely destroyed. Mornin'! And Welcome October...be kind to us please! It's 63°, cloudy with winds-a-howling in Wildwood. We've got cancellations and warnings all over the place. So far the only official cancellations of events this upcoming weekend is the "Gentlemen's Car and Motorcycle Races" and "The Mid-Atlantic Police & Fire Survivors Weekend". There are many more events on the schedule but haven't heard anything yet. I'll post them as I hear them. *When I arrived in work today I heard that all weekend events and activities are postponed. We're in emergency mode at the moment and every precaution should be taken to ready your home and family for safe keeping. Securing vehicles, furniture and property items is a must at this time (move to higher ground) . We've got us a Nor'easter and a Hurricane eyeing us up. First, is the Nor'easter...which we're feeling the effects now... and will feel for the next couple days. At this moment (10a.m.) the beach is under water. "WINDS" and "WATER" baby are heading our way. N-NE at 20-30mph sustained with 40+mph gusts and that will stay with us until these systems have chewed us up and spit us out...like on Monday. There's a 90% chance of rain showers all day today into tonight when it turns into steady rainfall. These enormous High tides will be off the chart and like we've not seen in quite awhile. Some have said that the tide/flood waters could exceed Sandy's depths. Temps will go down into the upper 50s with 25-35mph N-NE winds with gusts of 40+. This will all repeat tomorrow (exceptionally high tides), Saturday, Sunday and Monday by the looks of all the forecasts. Rip Currents:High(dangerous)creating major beach erosion as our beaches are beginning to disappear. Footnote: I'm now somewhat updated on what's coming down with these storms. For now...our concern is the tides. This Nor'easter is bringing with it major high tides. I've talked to several local officials and I'm being told that evacuation isn't such a bad idea (at this time not mandatory). I'm being told to get my vehicle off the island and onto the mainland before tomorrow. One of my fellow co-workers is evacuating. Just saying. Not sure what my plan is. As for Joaquin...just waiting to hear and see if it moves out to sea or directly hits our coast as various reports come in. One way or another, it'll be on my blog. In the meantime...hope you got the wellies ready or better yet...waders may be what we'll really need!